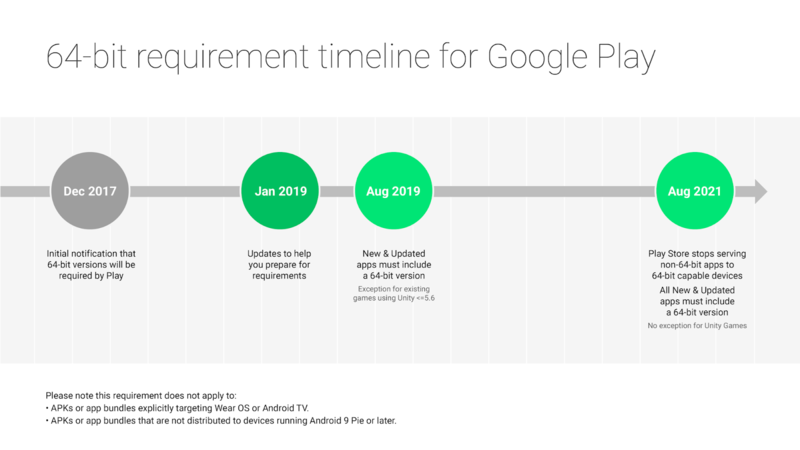 Google recently reiterated that, in the not too distant future, they’ll be enforcing a requirement for all Android apps using native code to provide a 64-bit version as they phase out 32-bit support. As you’d expect, this has far-reaching implications for app developers, depending on the languages and libraries they use – particularly for Unity and Adobe AIR developers. It appears that Google have granted Unity apps some leeway, pushing out the requirement for 64-bit support for existing apps to a much later date – no such luck for developers of apps using Adobe’s AIR technology. If you have developed any apps in Adobe AIR, Google will require 64-bit support for any new apps or updates after August 2019. Unfortunately, Adobe AIR doesn’t currently support 64-bit for the ARM CPU architecture. They are allegedly working on this, but it’d be helped if you upvote the issue tracker here and ideally contact their developer support directly, as a demonstration of how badly we need 64-bit support on Android for Adobe AIR apps.